When the hubby and I got married, we had the bright idea to use the silver letters we found on clearance at Target to spell out cute things on some of the tables (food, gifts, etc). Only...they were on clearance and the letters were pretty picked over. So my mom, myself, and one of our best friends hit up every Target even remotely near us. And we came back with quite a haul, but still some key letters ("O", "E") were missing. My mom found some gold letters at Steinmart that came on black bases and painted them silver to match. After the wedding, the letters were boxed up and packed away. My mom told me I could use them for our eventual house and I wondered where in the heck I would put them. And then, a couple of weeks ago, it clicked. These little knicknacks are perfect for our little knicknack shelves in the rec room. 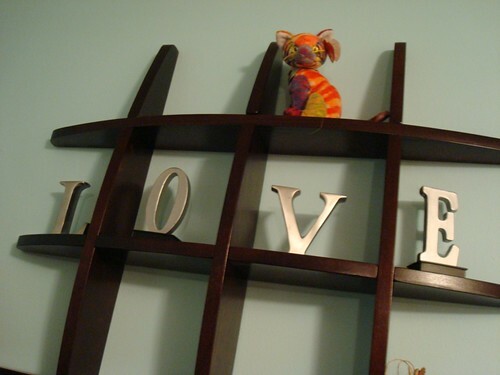 I chose to spell out "Love", which seems perfectly appropriate given all the love that surrounded our coming to own them.